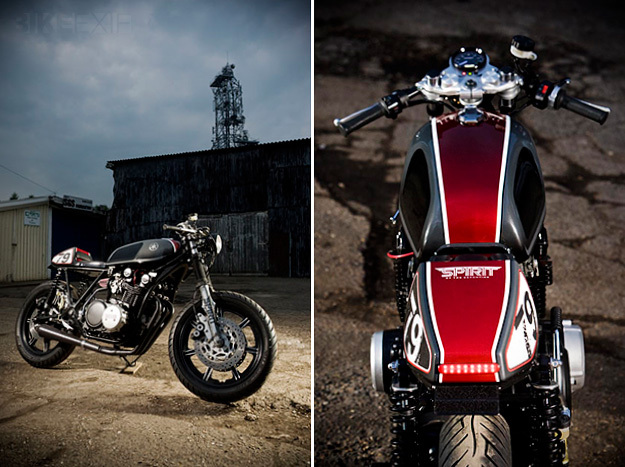 Their aim is simple: to build motorcycles that are “nostalgic, characterful, and sophisticated.” They’re up to build #3, but the machine you see here is Spirit II, the personal ride of managing director Tim. 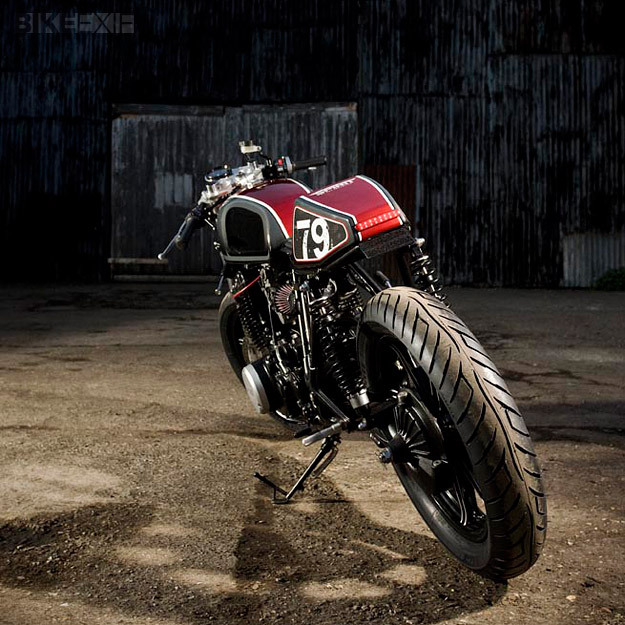 Constructed by mechanic Martin Taylor, it’s based on a 1979 Yamaha XS750 triple, a motorcycle originally geared for touring. 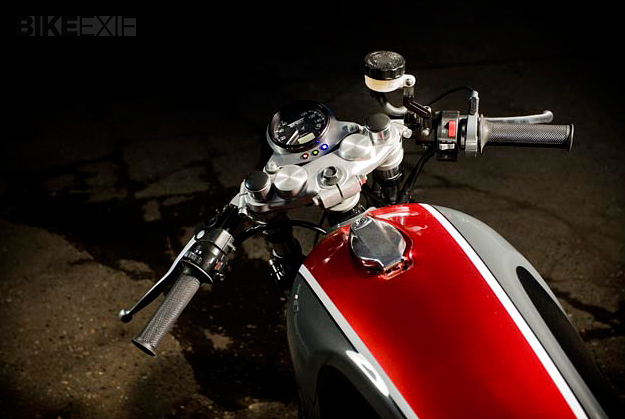 The frame has been de-lugged and powder coated, and the bodywork is custom-made. That includes the carbon fiber seat unit with leather seat pads—inspired by the 1997 Bimoto V Due—and a tail unit also in carbon fiber. 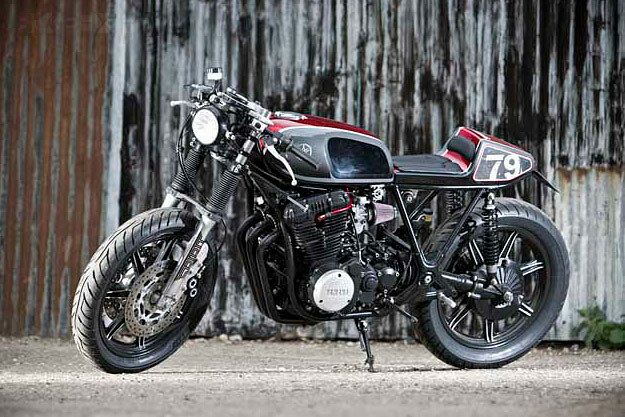 The motor has replaced by Yamaha’s later XS850 unit and fitted with K&N filters, and a ceramic-coated exhaust fettled by Gibson. SOTS has changed the stance of the bike for the better, fitting an 18” wheel at the front and Hagon shocks at the back: these are longer than the stock shocks, pushing the nose of the bike down a little and putting more weight onto the front end. The tires are reasonably sticky Avon Roadriders, and the front brake system is a Yamaha hybrid of R6 and FZR400 components. 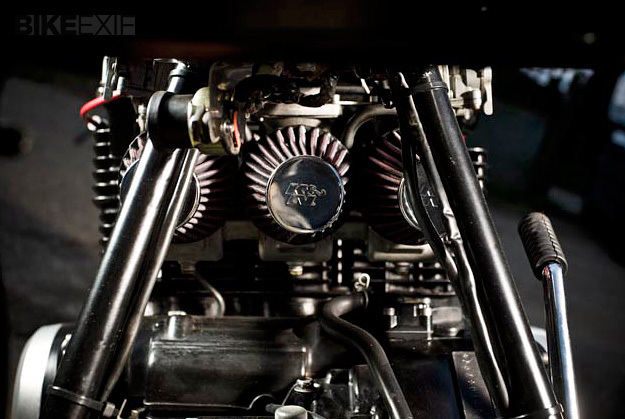 Other parts come from LSL—a long-time Bike EXIF favorite—including the clip-ons, headlamp brackets and master cylinder. To tighten up responses even further, SOTS has fitted a Tomaselli quick-action throttle and grips. The result is just the right side of slick, with a strong retro graphic style and the promise of very entertaining riding. 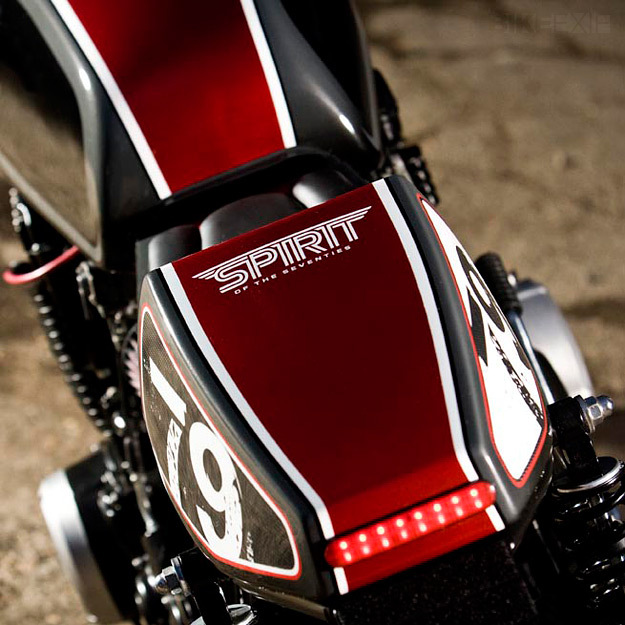 Keep an eye out for the name—I think we’ll be hearing a lot more about Spirit of the Seventies in the coming years. Images courtesy of Grant Robinson.